Chick-fil-A receipt refers to customer as "Chinese guy"
Ah, yes. The racial receipt strikes again! 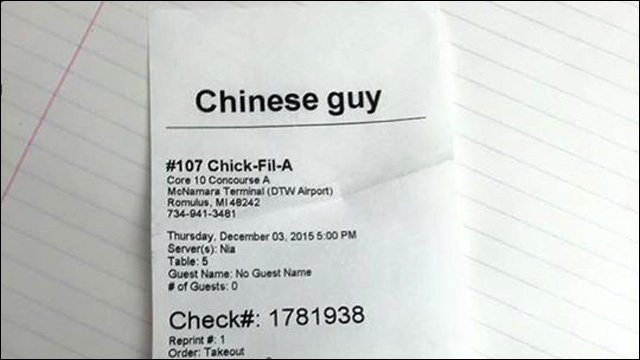 A recent customer at a Chick-fil-A location in Detroit was surprised to discover that instead of his name, the cashier had simply referred to him as "Chinese guy" on his receipt. Winston Chow, who is indeed of Chinese descent, recently bought a sandwich at the Chick-fil-A location in the Detroit Metropolitan Airport. Only later, when he looked at his receipt, he realized that Nia, the cashier, had identified him as "Chinese guy" in the space where, presumably, the customer's name should be entered. "Now I know why they didn't ask for my name when taking my order," Winston remarked, sharing a photo of his receipt on social media. He also posted the photo on Chick-Fil-A's Facebook page. While he's been a fan of the fast food chain for over thirty years, he says he was pretty offended. "How about some racial sensitivity or discretion next time?!" What's the big deal, you ask. After all, Winston is Chinese. Winston is a guy. Hence, "Chinese guy." Yes, but you have to wonder if Chick-fil-A regularly identifies all customers by their presumed ethnicity -- say, "Irish guy" or "Puerto Rican girl" -- or if this not-so-subtle reduction was reserved for just another Asian face. Really, Nia couldn't be bothered to ask for a name? There has to be a better way. Not that we needed more reasons to dislike Chick-fil-A. There are already plenty. At least the cashier didn't call him "Ching" or "Chong," which actually happened to a couple of Asian American customers at a Chick-fil-A in Irvine, California back in 2011. Somebody thought they were being clever. That somebody got fired. Check your receipts, folks. People are writing racist things on them.